South Korean Defense Minister Song Young-moo said Wednesday the country's robust alliance with the United States was a key element behind the success of the inter-Korean summit talks last week. During a meeting with a group of visiting US lawmakers, he also stressed the importance of the time-honored alliance for the future peace process on the peninsula, according to the ministry. The minister expressed hope for a "meaningful outcome" for denuclearization from the upcoming North Korea-US summit as he greeted the five-member delegation from the Congressional Study Group on Korea. The delegation includes Reps. Ami Bera, Jim Sensenbrenner, Janice Schakowsky, John Faso and Jimmy Gomez. 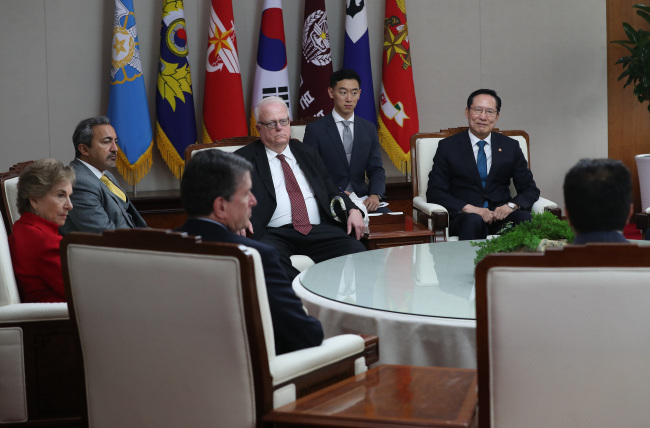 Song requested continued US congressional support for Seoul's initiative to establish lasting peace on the peninsula. The US lawmakers reaffirmed Washington's security commitment and contribution to the denuclearization of Korea, the ministry said. Last Friday, President Moon Jae-in and the North's leader Kim Jong-un agreed to push for the "complete denuclearization" of the peninsula and a peace regime in their summit at the border village of Panmunjom. Kim plans to meet with US President Donald Trump in the coming weeks.